Ruling: The United States Court of Appeals for the Ninth Circuit agreed with Newdow, but on June 14, 2004, Flag Day, the Supreme Court ruled Newdow did not have standing to bring the suit on his daughter’s behalf because he was divorced and did not have full custody. The case was thrown out, yet that didn’t stop Newdow from staging another coup d'etat attempt in January 2005. In Newdow v. Carey, he was again defeated as a 2-1 majority found that schools had the right to teacher-led recitations of the Pledge. In 2011, the American Humanist Society alleged that the Pledge violates the equal protection rights of humanists and atheists and demanded the court declare it unconstitutional under the Massachusetts Constitution. If they succeeded, Massachusetts would only allow patriotic ceremonies considering they do not refer to God. Ruling: On June 8, 2012, a Massachusetts state court upheld the Pledge as constitutional. It is now before the Supreme Judicial Court of Massachusetts. On Fathers’ Day, NBC omitted the words “under God” twice from a montage of children reciting the Pledge of Allegiance at the top of its U.S. Open coverage. In retaliation, Almost 50,000 Americans signed a letter from the American Center for Law and Justice demanding the network introduce a policy that would never allow the omission to occur. Ruling: NBC apologized and promised it wouldn’t make the same mistake again. Francis Bellamy, a Baptist minister, wrote the Pledge in 1892 and it was first published in the September 8th issue of The Youth's Companion. In 1954, Congress added the words, "under God," to the Pledge in response to a Knight of Columbus campaign. Fortunately, patriotic Americans have defended our right to stand and recite the pledge as both a national oath and a public prayer. I wonder if the Newdows of America will next try and rid the country of the phrase “God bless America.” Perhaps this concerned father forgot that our nation was founded on Christian principles. 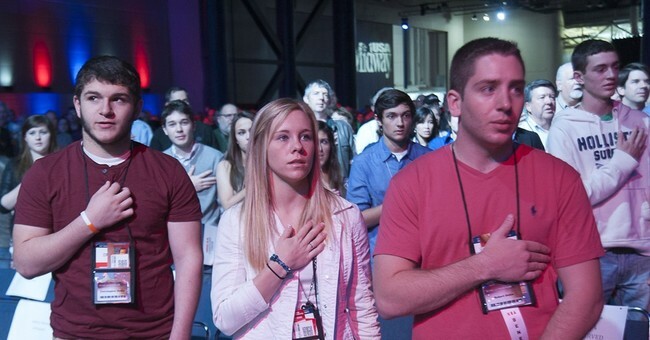 For now the Pledge of Allegiance – “under God” and all – remains a vital part of our culture. It allows us to stand with hand over heart to recognize not only our freedoms, but the One who provides those freedoms.